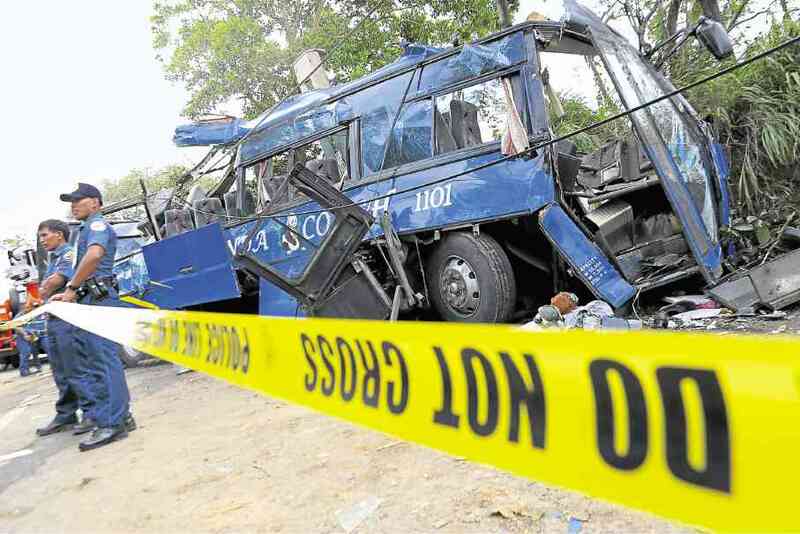 SAN PEDRO CITY, Laguna—The number of fatalities in the bus accident in Tanay, Rizal rose to 15 Tuesday, including one of the two teachers onboard the bus ferrying students to a camping trip. Teacher Dave Mark Baday was on the list released by the municipal government of Tanay. Also killed was the driver, Julian Lacorda Jr., an employee of the Panda Coach Tours and Transport Inc. based in Valenzuela City. The rest of the fatalities, all students of the Bestlink College of the Philippines, were identified as Jeid Cabino, Elmer Cabrera, Jonahfay Cerezo, John Michael Dagondon, Arneline Galauram, Emman Gel Garinto, Charlie Magdaong, Robert Kenneth Pepito, Hasmin Samauna, Princess Nina Sentonis, Jemmerson Mesicula, Gerry Bernardino, and Lovely Siringan. Carlos Inofre of the Tanay municipal government said it took them and the families a while to identify the fatalities, ten of whom died instantly and the rest in different hospitals. “The bodies were there but they were not easily recognizable (due to injuries in the head and face) until last night,” Inofre said in a phone interview Tuesday. Most of the victims, he said, suffered fractures due to strong impact when the bus hit an electric post in Barangay Sampaloc around 9 a.m. Monday while on a camping trip to a resort in Tanay as part of the National Service Training Program. Police said the driver lost control of the brakes as they were traversing the two-lane downhill road. “They were actually already past, around 200 meters, the steepest point of the road which was the accident-prone area,” Inofre said. He said there was an ongoing road widening project in that portion of the road and road warning signs for motorists. Inofre, quoting survivors, said the students noticed that something was wrong with the vehicle while they were still along Marcos Highway, about a kilometer ahead of the crash site.